When I worked for the Tucson Citizen I hated writing obituaries but I sometimes wrote columns of remembrance for folks I knew in the community. Haven’t written one since the paper closed, but the passing of Gene Jones gives me reason to say a few words. I first met Gene when I was covering the Tucson Symphony Orchestra. He was a member of the board of directors at that time. Some members of the board seemed to think they were there to have their butts kissed for the big checks they wrote. Gene was someone who really cared about that orchestra and the whole community. Every now and then he’d call me and we’d go to lunch and talk about the direction the orchestra was heading, how it was improving and what could be done better. Though he sought my advice, he also shared with me his own thoughts about all of this and they were on the money every time. He understood both the artistic quality of that group and its fiscal challenges. And he never tired of finding better ways that things could be done. One day he called me up after a trip to a Symphony Orchestra League conference and asked to meet as soon as possible. He was very excited about something he’d seen. We met up a day or two later and I could see that he was just reenergized from the start. He told me that one day during the conference he had a spare hour or two to kill and didn’t feel like leaving the convention area so he stopped into one of the conference rooms to sit in the back, rest a bit, and maybe take a nap. It happened that the room was where an innovative group of teachers from North Carolina, as I recall, were talking about a program they had set up in poor schools, using musicians from the local symphony. At first he was paying polite attention. But as they started to roll out the data about how this fairly simple program was radically improving test scores, attendance, discipline issues and the like, he gave it his undivided attention. He stayed after the talk and chatted with the teachers about how they had accomplished all of this. And by the time he got on the plane to return to Tucson, he had the fire in his belly to transplant this idea to Tucson. Like a Pied Piper, Gene got an every widening circle of people interested in the concept. 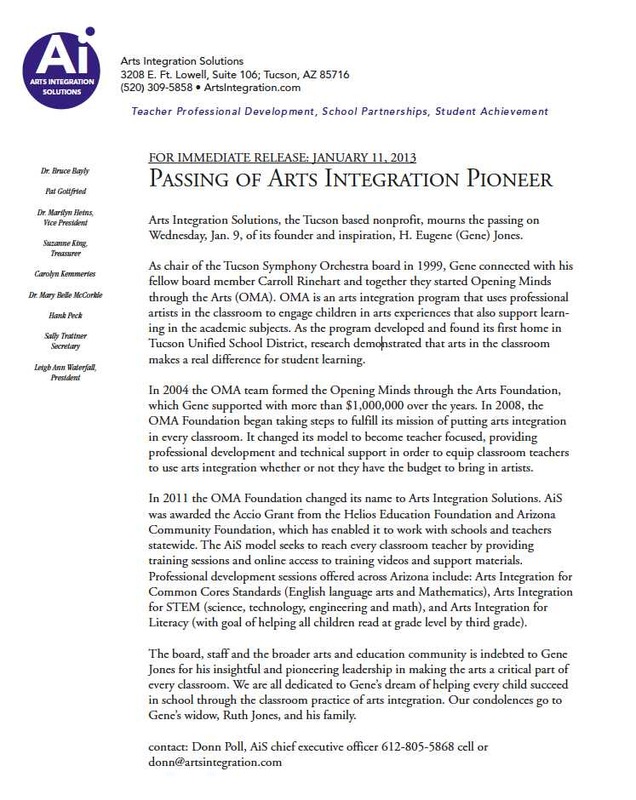 A few months later he flew the teachers from the Carolinas to Tucson on his own dime to share what they had done with members of the Tucson Symphony, TUSD staff, etc. Everyone came away ready to march on it. The following year Jones put up $1 million of his own money to give it a try, and got several schools in the poorest neighborhoods in town to agree to house the experiment. They called it OMA, standing for Opening Minds Through the Arts. They played classical music in the hallways of the school – mostly major key barque music – at moderate to low levels over the PA system. The rule became that no one could talk in the halls louder than the music was playing. Immediately the din of school hallways diminished. And funny things started happening. Sick kids started complaining to their parents that they didn’t want to stay home because it was an OMA day. The music programs the teachers introduced helped them understand simple mathematical concepts – higher and lower, more and less. They started to improve their vocabulary and spelling. Their scores n standardized tests started to dramatically improve. Education was succeeding, and both the regular teachers and the OMA teachers could see it happening before their eyes. Jones knew anecdotal evidence was not going to cut it, so he got the University of Arizona’s education and music departments, plus an independent group, to start tracking and verifying the results. The program spread to more schools. They got huge grant and big community support. It was a major success story. 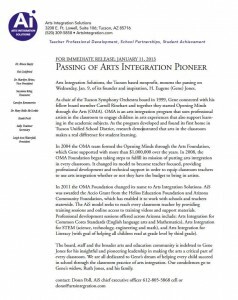 Later OMA branched off and became Arts Integrations Solutions, which works with arts teachers and regular teachers of all disciplines to make art part of the solution in public education. Without Gene Jones’ vision, enthusiasm and stubborn devotion, the lives of many Tucsonans would not be nearly as successful and our schools would clearly be diminished. Thank you Gene for all you did, for your wisdom, your generosity and your caring. Can’t wait to see how you’ve improved the next world when we get there. ~ by Daniel Buckley on January 11, 2013.